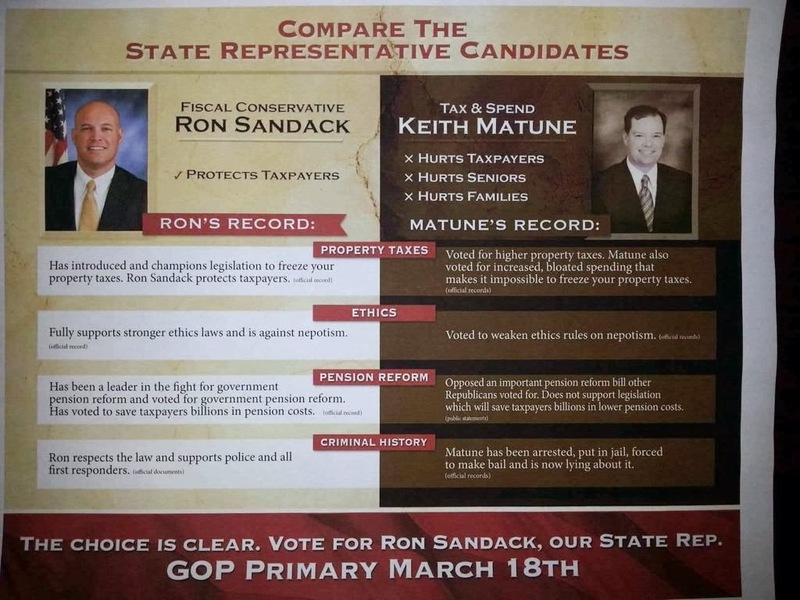 This mail piece was shared with us via Twitter and with all the increased attention to the race between Ron Sandack and Keith Matune, we thought it would be worth sharing. The takeaway here is: "The Choice Is Clear." We can't agree more. We've been consistent from the start here on the Truth Team. We're backing Ron Sandack. Not because of what he's done. But because of who he is. We're, unashamed, rooters for the ILGOP. And we know that if the ILGOP is to survive, let alone win races, we need more guys like Ron Sandack - who is energetic, smart, and willing to do the right thing while standing for smaller government and fiscal sanity. As for Keith Matune, the fatal blow isn't his arrest record (while that isn't a positive thing), rather it is unfettered willingness (and some may even say 'enthusiasm') for raising property taxes. Let's stop him at the School board before Keith Matune can raise even more of our taxes. If you want to see everything we've written on Ron Sandack, you can check out our Ron Sandack Archives here.